I recently started working with fondant and I have seen several baseball hat cakes and I had to try it. 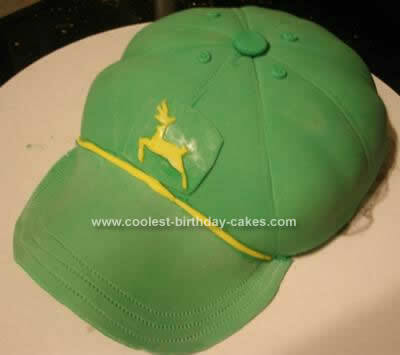 I made this John Deere Baseball Hat Cake by using the Wilton Soccer Ball Pan and cutting a template for the bill of the hat and cut out of fondant. I used the stitch embosser for the stitching around the bill. I used tip number 12 and 5 to make the vent holes at the top and took a piece of thread to pull across the top of the hat to make the different panels. When I cut the bill of the hat I actually put a piece of saran wrap on one of my hubby’s hats so it would dry to the correct form. The soccer pan wasn’t deep enough so I will probably use an oven-safe bowl next time. After this picture was taken I steamed it a little and I loved the result. I didn’t get a picture of it steamed before my family dove in to the cake. (Excuse the icing that gooped out from under the fondant onto my board).